No-one wants to run out of ammunition in the middle of a firefight, and this tough TACO pouch from High Speed Gear keeps a second magazine within easy reach. 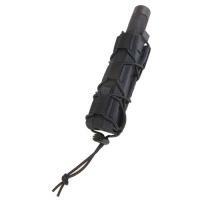 The extended pouch is long enough and adjustable enough to fit most high-capacity pistol and submachine gun magazines thanks to adjustable shock cord lacing, making it extremely versatile. Even if you don't plan to carry extra ammunition, it will also accommodate larger collapsible batons and flashlights, so there is always a reason to keep one on your belt. Its ballistic nylon construction gives it the durability it needs to last in combat conditions, and the sturdy belt clip fits belts up to 2 inches wide.